We received the Phonetic Zoo Spelling Level A [Starter Set] from Institute for Excellence in Writing to review. It's a self-teaching spelling program. It combines auditory and phonics lessons to fully master each word. Children can work independently or with a parent's assistance. Level A is recommended for children in grades 3-5, or as remedial work for children in grades 6-8. It can also be used by children with special needs. When purchasing any level from the Phonetic Zoo Spelling sets, you should always purchase the Starter Set with it, so you have all the additional materials you'll need for the lessons. If you already own the Starter Set, then you can simple buy the audio CDs. 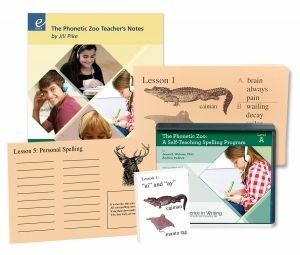 The Starter Set includes 5 audio CDs or an MP3 download (Level A, B, or C), Level A-C's Lesson Cards of spelling words, Personal Spelling Cards to keep track of misspellings, Zoo Cards for practice and rewards, an MP3 download of the Phonetic Zoo Teacher's Notes, and a Spelling and the Brain video. If you are unsure what level your child is at, you can have them take the placement test. The Level A audio CD set contains five discs and each disc has 18-19 lessons. Bean and I worked on the lessons together. We only worked on one lesson per week, though sometimes it took us longer. We worked on the lesson three days a week, 15 minutes each, and mainly focused on introducing the subject matter, rather than fully mastering it. Bean is excited about spelling, but we don't pressure her to learn it all at once right now, since she is still young. This phonetic curriculum is great for laying down a strong spelling foundation that she can learn from. On the front of the Lesson Cards you'll find pictures and the name of the animals and birds that focus on the word sound, along with three words for each level. For example, Lesson One features a caiman and a manta ray, along with the words brain, always, and pain for Level A, wailing, decay, and sailor for Level B, and ailment, portrayal, and tailored for Level C. The back of the card features the same rule, jingle, or hint from the Spelling Zoo Cards, along with a list of fifteen spelling words for each level. The Spelling Zoo Cards are Bean's favorite part of this curriculum. She loves starting off each lesson listening to the jingle. It's not always a jingle, sometimes it's a rule or hint. But they have inspired us to come up with little songs for each lesson. As for the auditory lessons, we generally use it at the start of the lesson, and then use a dry-erase board and practice worksheets the rest of the week. I made the worksheets, and for each word, there is a traceable version and a write it yourself line. Since the spelling words are grouped into five groups of three on the Lesson Cards, we decided to focus on three words per day, hence why it generally took over a week to complete each lesson. We look forward to continuing to use the Phonetic Zoo Spelling Lessons in the future. We plan to purchase Level B and C when we get to that point. I really think the audio CDs are worth it. It allowed Bean to work independently, which she prefers. We both really enjoyed using the Phonetic Zoo curriculum. I loved how easily it taught her spelling lessons, while she learned a better understanding of how words work. 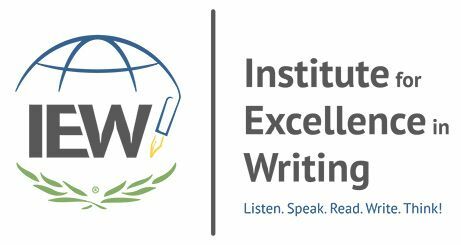 IEW is one of our favorite curriculum brands and I will always swear by their products. I highly recommend them for other homeschooling families. They continue to help ours and I know other families will find success with them. If you would like to read more reviews on IEW from the TOS Crew, click on the banner below!